With heating oil prices constantly on the rise over the past several months, many people have started looking for alternative ways to heat their homes, but most end up coming right back to what they started with. Avoid becoming one of the many who gets stuck using home heating oil, and do your part to help out the environment at the same time with these suggestions for heating your home the green way. Perhaps one of the most obvious ways to steer clear of heating costs but still heat your home is to use your fireplace or a wood stove more often than you currently do. While some may argue that it's not exactly a "green" heating alternative because of the amount of wood each device requires for burning, it's actually not so bad. There are logs out there that you can purchase specially that are meant to burn longer than regular wood. There are also synthetic logs on the market that still burn longer than their natural counterparts. And by using a fireplace or wood stove, you're dramatically reducing your energy costs, thereby saving the environment from enormous greenhouse gas emissions. Perhaps the most efficient way to heat your home aside from a traditional fireplace, as well as a more green answer than burning wood, is a pellet stove. 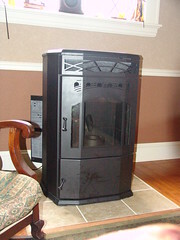 Pellet stoves are generally inexpensive to install because they don't require any ventilation from a chimney, but they can be tricky to put in. They're newer than fireplaces and easier to keep running to use as a full-time heating source during colder months. The Environmental Protection Agency names pellet stoves the most environmentally-friendly heating device because they burn cleanly. They actually pollute so little that they don't even require EPA certification for their emissions. They burn little compressed wood pellets that are cheaper to buy than firewood or even electricity. A pellet stove does require some electricity, though, to keep the motor running to burn the pellets, but it's a tiny fraction of the cost of electric heaters. These trendy new fireplaces burn bio-ethenol fuel instead of wood or gas, making them incredibly eco-friendly. Plus, they're so new and modern that they make an awesome aesthetic addition to any home. EcoSmart fireplaces can either be built into an existing fireplace so it looks like a real fireplace, or they can be free-standing so you can do as you please with them. They're a great alternative way to heat your home because they do produce real, warm flames - just without the harmful emissions. The bio-ethenol that they do burn is a completely renewable and sustainable resource. If you feel any drafts coming into your home while it's cold, make a point of filling in the spaces where the cold air comes in. This is easily accomplished by stuffing blankets or (safe) insulation into the cracks. You can also cover your windows with plastic that keeps the cold air out. It may look a little strange, but all you need are some good, decorative curtains that take attention away from the plastic. And speaking of curtains, buy a set that's thermal to trap the heat inside and help keep the cold out. You'll be able to manage the heat in your home much better if you try just these simple changes. The easiest way to stay warm during the cold months - cuddle up under a nice comfy blanket! Better yet, get a buddy or a significant other to snuggle up next to and share some body heat. Pets also make wonderful natural heaters, so get close!